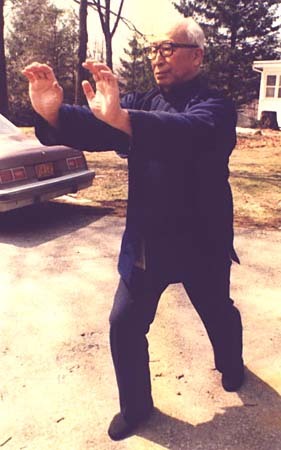 It was during one of my Hsing-I classes that I questioned my higher level students concerning their practice of the Five Element Drills of Hsing-I Chuan, which are called Pi Chuan, Hung Chuan, Pao Chuan, Tsuan Chuan, and Pung Chuan. After observing their movements and making necessary corrections in posture, I noticed that although their form was adequate, their chi power was lacking. There was a great amount of physical force being displayed, as opposed to internal force. I decided to stop them and ask some questions. Addressing my group of students, I said, "Anybody with normal physical ability can imitate the movements of Hsing -I Ch'uan. Does that mean you have learned the secrets of Hsing-I Chuan? The answer is no, because it is not the movement, but the source of power which drives that movement that I am talking about. But what is the source, can anyone here tell me?" One of my students responded by saying, "Shifu, is it the mind? After all Hsing-I Chuan is called Mind Boxing." "You are correct; however there is more than just knowing this, to affect the quality of your Hsing-I Chuan. When mastery of Hsing-I Chuan is attained, the moves look effortless and flowing, yet contain a powerful force when confronted. It is a combination of natural power, stemming from a relaxed body, clear mind, and intense focus on detail." For people who are new to the study of the internal arts, this concept is indeed a hard one to understand. A student can spend years before reaching a true understanding. We try and we practice so hard at this art form, but it rarely comes quickly for people. It is a simple theory of how to manifest our power and use it with Hsing-I Chuan. It is the same power used in Tai Ji Chuan, or Pa Kwa Zhang. The power remains the same in all the arts. It is only the theories about how to utilize this power that change. Chi power is a natural phenomenon which we all possess, but until we are born again back to naturalness, it remains elusive to even the most discerning eye. It becomes simple once you understand how to enable this natural power. When we see the Shao-lin Monks display great feats of Chi Kung Power, we are amazed and attribute this to some secret training method exclusive to the Shao-lin Monks. Of course this is not the reality of it. The real Shao-lin secret lies in the practice of the San Bao, which translates as the "Three Treasures" namely, Essence, Chi, Shen. Essence, refers to you, Chi, refers to our natural prenatal force, and Shen, and refers to our mind. More will be said on these three gifts, but for now understand this: without drawing our full attention to this cultivation there will be little, if any, true transformation to the level of expert in any style within the Shao-lin systems or Wudang systems. The external arts, such as Shaolin Kung Fu, are far easier for a new student to understand, as they deal with external or physical strength. Physical strength is something we all understand. However, the internal arts deal with a force that stems from deeply within, which is very subtle and hard to apply in the formative years of training. Yes, some catch it more quickly than others; it all depends on one's determination to find the answers. Remember, answers will never come to you, you must go to them. You must make every effort to understand something, then test it by applying it. Only then will you know for sure if you have succeeded or not. I then asked a few of the students to demonstrate their Hsing-I Ch'uan for me. After completing the sets I commented that I saw more of the external power being demonstrated than I saw of the internal arts. Their performances appeared fairly powerful, fast and effective, but they were being fuelled by external force rather than internal force. I commented, "It will take time to find the subtlety of the internal arts. It took me years to come to certain realizations, and only then after constant study and practice. Then one day, it happens. You feel it, and your eyes open wide in amazement. 'Wow,' you think, 'that was powerful and fast, yet I feel so relaxed, yet firm like a mountain.' Then you will know what I can't explain in words. "Don't be disheartened if progress comes slowly. Try to enjoy the journey rather then looking for some form of finality to learning, which never really happens in life. We are always learning and the martial arts are part of that learning." Classical form is only part of the learning process. 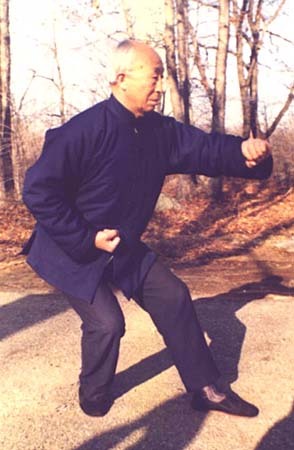 Once you know a structure like Pi Chuan, (chopping fist) for example, then what? It's only a form; I know many of you here now can demonstrate a decent Pi Ch'uan for me, but that's only the physical appearances. Does it have real chi power, or are you using physical power? Are you able to apply it freely and know its many variations and possibilities? In short, is it the real thing or just a good imitation of the Pi Ch'uan movement? Addressing my class I said, "You will eventually come to know the difference between Yin and Yang. But is it is a slow unfolding. It rarely comes suddenly. It takes work and a real desire to know. The first step is to stop, calm down, and look logically at what makes an internal art an internal art. It stems from the mind, more than from the body. It comes from our Essence, directed by a clear unobstructed mind, and is manifested in the body by structure or form. It all starts with cultivating the San Bao." I asked another of my students if he remembered all I told him of the meaning of the San Bao. He looked back at me with the look of uncertainty, which told me volumes that he was not really practicing inner cultivation. I further elaborated by saying to him, "If you don't nurture the seed, the flower will never grow." I alluded to the fact that if there is no practice of San Bao, then cultivating internal chi power would be nearly impossible. Of course everyone has chi power, no matter what you study, or don't study. But trying to come to terms with its existence and cultivation is what I am referring to. This entails the study and practice of the San Bao. Practicing San Bao is what makes an internal art an internal art. I said to the class, "Let me repeat some points concerning what the San Bao is for those who might not have heard me speak of it before." The word "San" in Chinese means "three" and the "Bao" mean "precious gifts." What exactly is the meaning of these three gifts? The first is called Essence. Everything has it own Essence. Take a dog, for example. If he looks like a dog, moves like a dog, reacts like a dog, therefore he is a dog. What makes up that dog? Of course the eyes, ears, legs, internal organs, and the dog has a heart and veins with blood coursing through them, and it has a brain and a personality unique to that dog. The dog's health is dependent on the food it eats, the exercise it gets and the proper care from its owner. If any of these factors are not tended to, the dog will have a shorter and poorer existence. The first step is to stop, calm down, and look logically at what makes an internal art an internal art. It stems from the mind, more than from the body. This is Essence. It is what we are, what we are made of, what we think, how we feel. If we understand these facts, then we can understand how the development of chi energy would be dependent on the quality of our Essence. We are no different than the dog. We may have different needs, but still we need to address all these issues to maintain our internal balance and to nurture our good health through proper care, rest, food and exercise. This is the bedrock, or should I say, the fertile soil from which strong chi power arises. Your Essence is, in fact, what you are. It is all that you call "YOU." Each of you has to first cultivate your Essence, because that Essence represents all that is YOU. You would think people would naturally understand all these facts yet, if questioned, it is amazing just how little people really know about themselves. If we bought a new car, the chances are we would know more about that new car and its maintenance than we know about our own bodies. So, the first step toward development and maintenance of chi Essence is to nurture our self, by purifying our Essence, and to bring it into a balance with nature. We must exercise it, give it ample rest and food, and most of all, develop the ability of pure focus and unity of mind and body. Without nurtured Essences how can you expect to see powerful and controlled chi power manifest itself in your Hsing-I Chuan? Just by looking at you, I can see you are tired already; I can see many of you are sweating and already feel weakened. You are burning up now and exhausting what little energy you have trying to do Hsing-I Chuan. You won't feel any better after this workout today, in fact you feel more tired as you now have depleted what energy you had before you started practice. If you were following true development, then I would be seeing your internal power, and you would be standing there looking relaxed, with a storehouse of accumulated internal chi, instead of looking like you want to go to bed. The development of internal power does not come from Hsing-I Chuan, it comes from you. Hsing-I Chuan is just a means to manifest the power you have already accumulated and natured. Our Essence development is only a part of total scope of the San Bao. You can see logically that without Essence enhancement, moving on to the second gift of Chi nurturing is a useless endeavor. We must come to understand at higher and higher levels just how chi works and how it nurtures our bodies and fills us with universal energy. We are born with a certain amount of chi. Some use their chi wisely and others burn their chi up very quickly. In Taoist theory we are born with a certain amount of chi, each of us have varying amounts. We use this chi during our life to accomplish the things we wish to accomplish. Some use their chi wisely and others burn their chi up very quickly. You may have heard the expression "living in the fast lane." However, this life style will almost certainly cost you a large amount of your chi reservoir, and when that reservoir is depleted you die. It stands to reason that we must consider this and learn to value chi by not to wasting it. We should rather focus on replenishing our supply and cleansing our bodies of stagnant chi. I asked another student, "What is chi?" My question sparked a number of answers. One student answered, "Chi is Universal power, and we store it in our Dan Tyan located at our center." I said, "Yes, you are correct, except you refer to chi as something separate from you, something you have to attain from elsewhere. Chi is you, you are composed of it. You are Chi now and always were composed of chi even before you were born. This is why we call Chi the second gift. With the first gift of Essence we prepare the body, discipline the body, and cleanse the body. Only then are we ready for the second phase which is to nurture this Chi, and use it effectively to achieve long life, good health and, of course, good Hsing-I Ch'uan. We have to again look deep within ourselves and see what we are made of." I asked another student, "What is an Atom." Her answer was, "It is a positive and negative force, one being the electron and revolving around the nucleus." You are chi now and always were composed of chi even before you were born. "Very good. Now do you know how much empty space exists between the electron and the nucleus?" She was not sure, so I explained to her, "Think about an apple lying in the center of a football field. Well, that apple represents the nucleus and the perimeter of the football field represents the revolving electrons around the nucleus. As we can now understand there is a great deal of space between the two energy forces. I ask you now, what do you think resides in that empty space between the nucleus and the electron?" Her answer was quick. She said "emptiness, no not emptiness, but rather fullness. It is the energy we call Chi that fills the space between the electron and the nucleus, as it does with every other living cell in your body. We are filled with chi; however, the quality and quantity make the difference in the way we live our lives." Chi has been made too exotic and mysterious. The average American has no idea what Chi is. With all the books now on the market you can read about this so-called mysterious and powerful energy. But it is made to seem as if it is something special and only a few people can achieve true chi cultivation. But, in reality Chi is all around us and in us. The universe is composed of it, there is nothing to do to attain it, just become aware of it and cultivate what you have. It is just a matter of building upon what you already have. It is not a secret of the Chinese. In America we know of this energy. We may call it by another name, but it is the same. We may think of it somewhat differently from the Chinese but that's where the difference ends. Chi still remains Chi. There is nothing to attain because you already have it. "So why should we worry?," I ask my student. His reply was, "Well I guess we should not worry then, according to what you have told me." I answer back, "Sorry, wrong again. You must indeed be concerned, and observant of your chi balance." I addressed the whole class when I observed many of the students looking like they ran the quarter mile. 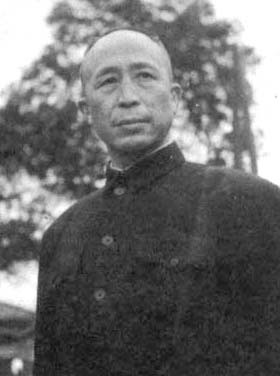 They had become exhausted practicing their Hsing-I Chuan. Practice of the internal or external arts requires the expenditure of energy. If you don't replace that energy you will exhaust yourself. I said to the whole class, "Practice of the internal or external arts requires the expenditure of energy. If you don't replace that energy you will exhaust yourself. Then your training will weaken you rather then strengthen you. What you take from your body you must replace. This is why we must follow the San Bao." Methods of increasing or restoring your chi levels are of paramount importance if you wish to display your Chi power in your Hsing-I Chuan. Without the cultivation of our internal chi how can we expect to see real internal power manifest itself when we need it. So, the first thing you want to do is cultivate the second treasure, namely your Chi. You must come to know how to relax and focus your chi, you will have to come to know how to unify the whole of your body to one point. This is the unseen force that drives your Hsing-I Chuan. "Remember," I said, "Hsing-I Ch'uan comes from the mind and manifests itself in the body. Hsing-I structure comes from the body and the body is supplemented by internal chi for defensive applications. Therefore, is it reasonable to assume if a student does not work hard on internal development then his or her internal art will be lacking as a result of this?" Our chi maintenance must be done faithfully each day so we will be able to restore chi levels, disperse stale chi, and restore fresh chi. If we do this, the effort on any internal art form will be profound. If you are persevering in your practice and contemplations, then the mystery of the arts will become known to you. The methods used for chi cultivation are not complicated. 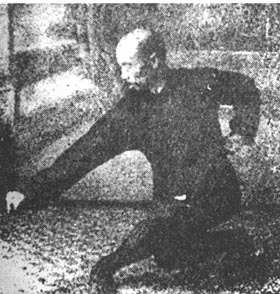 In fact most, if not all, chi kung methods are rather easy to do. The problem comes with consistency of practice and then the quality of the practice. If you are persevering in your practice and contemplations, then the mystery of the arts will become known to you. Hsing-I Chuan will take on a flavor you have not known. You will discover immense power through softness. Your energy will stem from softness rather than from just trying to imitate the moves through physical means. You will feel the real power in the move and know what an internal strike is really like. It is not just the sweat of hard training that brings success, although that is a part of it. Rather, it is the combination of clear understanding and stored chi that awakens the power of Hsing-I Chuan. This is likely the hardest to develop, yet is the most important of the San Bao. I asked another student what he thought the relationship was between Hsing-I Ch'uan and Spirit. My student replied, "Is it, that Hsing -I translates as 'Mind Boxing,' so both must be related in some way with the use of mind as a source of power?" "Yes, you are correct," I answered, "however, let me elaborate a bit more. Hsing-I stems from the mind, so the question that should arise is 'what is mind?' My interpretation of mind is that it is nothing but an accumulation of information, facts and figures, imbedded in you by society and family. It is the way you view the world and come to understand how to deal with the world you live in. "There is an old saying which states 'change your mind and you change the world.' This statement could not be any truer, for your world exists in your mind, not somewhere out there. It's within you. If the mind could somehow be cleansed of negative influences, it would serve you well in everything you do, including Hsing-I Ch'uan." My point is: you have to use the mind, and not have the mind use you. When you become the master of your mind, you will have the power to summon your chi at the mere thought of it. You will come to know the relationship between thought and action. You will be in total communication with your body. You will come to know the art of relaxation of the body and mind. You are all trying too hard with your physical strength to attain strong Hsing-I Ch'uan. This will never do. You will exhaust yourself, and after years of practice you will simply run low on physical energy, as the body ages. Then, you will stop the training, never having known true internal power. True internal power does not rely on the physical as much as the physical depends on the physical. So, you will only get better in time as you relinquish your physical prowess, to the softness of the internal energies. The Chinese call this subtle internal power "pung jing" power. Martial arts books go into elaborate detail on this mystical power, when is reality it is a natural power that can be developed by anyone who wishes to practice hard enough. But what is ping jin? I would say pung jin force is the harmony of mind and body coming to a crescendo at the same moment in time, releasing pure chi power or pung jin. You may wonder what chi power feels like, so let me try to give you more examples by saying it is something like a huge wet towel. You know how heavy a towel can be when it is soaked with water? It becomes very heavy as the towel takes in every drop, absorbing all the water to its fullest capacity. This heaviness that you feel is how our root feels: heavy, sunk deep into our stance which now seems rooted to the ground. Once rooted we direct our chi with the mind and the body explodes with snapping, or whipping or chopping power. I think you can well imagine what it might feel like getting hit with one of those towels with a fast whipping, or pounding motion. Your body has a feeling of fullness, like a feeling of swollen hands, but your whole body feels this way, swollen with chi force. It can't really be explained in any one particular way, because it more of an experience thing rather then a learned thing. But once you experience it, the mystery ends and the mastery begins. Chi becomes your slave, to do your bidding instantly on your mental command. All this sounds so tempting; who would not want this control, this power? But obviously, few actually practice hard enough to attain this inner control. Looking into your own mind is the hardest thing for all humans to do. Those of you who are in my meditation classes know how fast people fall away from training. It is simply too hard to practice with seemingly no return for all your efforts. But, in reality there are great effects on the human psyche if you train long enough. Once you see this and experience it, you will never stop looking for higher levels of wisdom and internal control. We call the point between your eyebrows the "third eye" or "heavenly eye" and it has a connection to the pituitary gland located in the forebrain. This point is said to control psychic energy and has much to do with a powerful mind. With practice this eye can be made to open, at least blink. This is done by the practice of the San Bao, looking deep into the mind and activating the powerful point. But once it does open there will never be a turning back, for you will be on the road to new knowledge. Your movements will change and harmonize. Your Chi will be at your command, your body will find root it has never known before. This knowledge is available to all who open the doors to the inner chambers of the mind. We have to learn the art of LOOKING. As strange as this may seem, very few really see. As I often say to you, ""even if you had three sets of eyes you would not see anything more then you do now." True seeing comes from a clear mind that moves in the ever changing now. In reality, there is no present moment. By the time I say 'look here it is,' it's gone! The present moment is passing as we speak, but most don't see it. By looking into the mind, we come to know the now as it passes. In our meditation classes many of you practice seeing the ever changing now. You are coming to notice its passing, and can react to it instantly. This insight relates directly to your Hsing-I Ch'uan applications. I can teach you for the rest of your life and you will still be poor if you don't come to see change in action. I can teach you for the rest of your life and you will still be poor if you don't come to see change in action. A good fighter can see opportunity for attack instantly as it passes by the eye. But you must be able to see with a calm clear mind. You must see and react at the same instant. There is no thought in between, it is just seeing and reacting to the passing now. With the skill of seeing, good opportunities for using your defensive moves become limitless. It is the mind and the control of it, which enable Hsing -I Ch'uan to be the effective combat art that it is. Enough for today, I have explained what I had to explain, I have made corrections to your forms, and there is nothing left I can do for you, now you must do the rest for yourself. Now it is time to look more intently into the San Bao and it meanings. There you will find yourself.